UV400 & POLARIZED LENS - UV400 protection coating blocks 100% harmful UVA & UVB Rays. 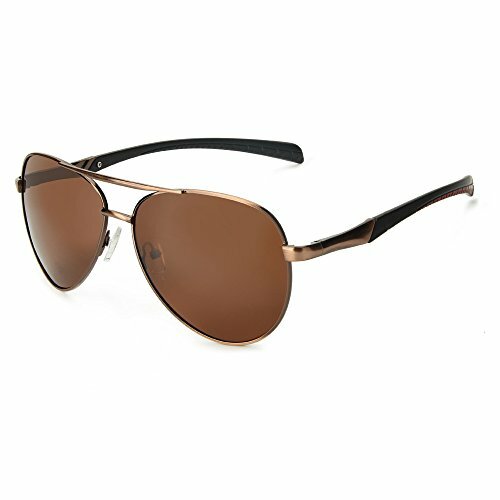 Polarized lens reduce glare reflected off of roads, bodies of water, snow, and other horizontal surfaces. ADJUSTABLE SPRING HINGE ARM - Elastic Spring hinge help you to adjust temple freely to fit your head, giving you a comfortable stress-free wearing experience. It is great choice for any size face to wear for a long time. Antioxidant LIGHT WEIGHT Alloy Frame - Alloy frame is antioxidant plating, anti-allergy & skin-friendly tested, harmless to skin. Light-weight design is ideal for motorcycle and cycling bicycle, driving, running, fishing, racing, skiing, climbing, trekking or other outdoor activities. SKIN-FRIENDLY NOSE PADS - Elastic and weight-free nose pads enables you a long-time wearing without fatigue. 100% RISK FREE PURCHASE - Lifetime Breakage Warranty on Frame & Lens and 90 Day Money Back Guarantee.